GET ONE EXTRA ISSUE FREE WHEN YOU BUY A ONE YEAR SUBSCRIPTION, FOR ONLY $25, DOWN FROM $29.95. OFFER ENDS TUESDAY, APRIL 23RD. 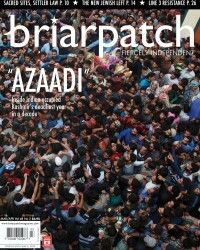 Briarpatch delivers! 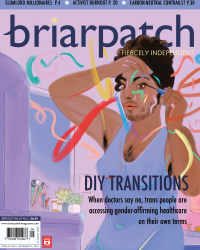 Subscribe now to start receiving bi-monthly doses of feisty, critical analysis delivered into your hands. Use our secure form to pay online with your credit card, or we can bill you later. Already a subscriber? 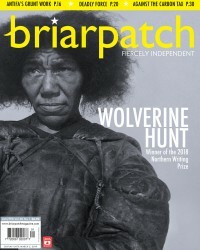 Renew your subscription below, click here to update your address, or send Briarpatch as a gift to friends and family. We also offer discounts on bulk purchases of three subscriptions and ten subscriptions for subscribers in Canada. 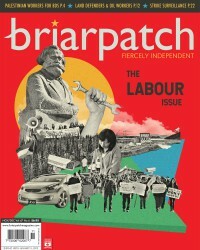 Or go paperless and get a digital subscription of Briarpatch.